One of my favorite things about being a former student ministry intern is watching all my former students grow up. I may have met them as awkward 14-year-olds but now they’re slightly-less-awkward 20-somethings who I legitimately call friends. I get to rekindle some of these old friendships every January/February. As my friends start looking for summer jobs or internships, many of them need recommendations. They end up texting or calling me asking if I would fill out a form or write a letter on their behalf. Each conversation is different but they’re always fun. I get to hear about the good times, the bad decisions, and everything between. Sometimes they’ll ask for advice; sometimes they won’t. I often get to tell them some of the stories from when I was in college that may have been a little too “mature” when they were in high school. It leaves us laughing and, more often than not, makes me realize I wish I had someone to tell me some of the things I get to tell them. 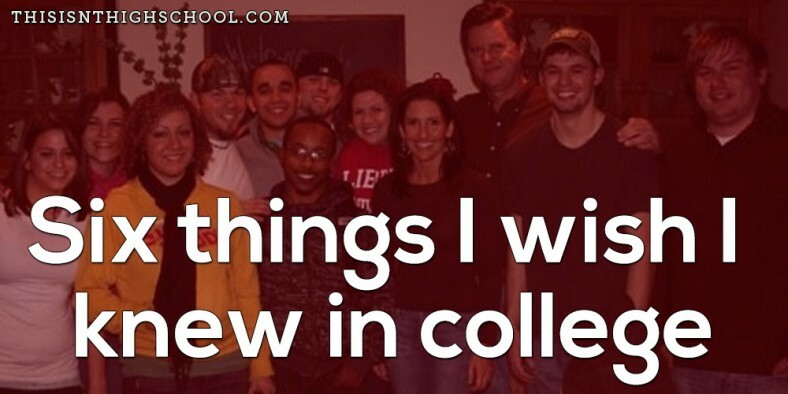 Because of those stories – and the lessons from them – I wanted to share the top six things I wish I knew in college. 1) Grades don’t matter as much as experience. The right internships – I loved working for Liberty Football and had a blast doing it. If I did it again, I’d focus more on learning from the coaches and administrators than having a good time with the players and support staff. The why behind a paper/project – I could pump out projects and papers without even thinking about it. They were easy to me. I was that kid who could start the night before and in three hours have a 12-page paper written and still get an A. Yes, I know. You hated that kid. If I were doing it again, I’d use those papers and projects to learn more about the things taught than about getting the grade. 2) You’ll never laugh harder than on a road trip with friends. I started a club in college called The LUnatics. We were the student fan club for Liberty athletics and traveled all over Virginia and the Carolinas to go to games. It was nothing for us to get in the car and travel four hours to a basketball game on a Tuesday night when it was supposed to snow. I think of the stories we lived while on those trips and still laugh. Like the time we were coming back from a basketball game when one car pulled off the side of the road to wait until the second one caught up so we could moon them. Or the football game that went into double overtime and we didn’t get home until 3AM. And how one guy stood on the side of a highway yelling, “C’mere deer! I wanna eat you!” while we switched drivers. Whatever the reason, getting in a car and going somewhere with your best friends is something that will never get old. 3) One time isn’t one time. One time here is okay because I’ve been so good for so long. What no one tells you is that one time sticks with you forever. Those memories never go away. You don’t want those memories popping in your head when you’re older and find the girl of your dreams. They can’t exist if you don’t let them happen in the first place. Don’t justify one time. It’s not worth it. 4) It’s okay to not have it figured out. I stressed out so much trying to figure out what to do with the rest of my life. I didn’t know if I wanted to work in college athletics, pro sports, teach, or one of a hundred other things. Once I realized God was calling me to the church, I didn’t know if I wanted to do student ministry, church planting, or sports ministry. Come to find out, four and a half years out of seminary, I now have two degrees and I’m working a job that has nothing to do with either of them. My job is the hobby I picked up while all my friends were partying. Your life will teach you what you’re supposed to do with it and it will change over time. Don’t freak out if you don’t know what you want to do until you’re 70 when you’re 20. 5) Friends matter more than a girlfriend. Maybe it was the Christian college culture, or maybe it was my endless desire to be liked, but whatever the reason, every girl I met in college went through the filter of, “Could I date her? Would she date me?” Instead of letting a friendship turn into more (like it did with my actual wife), I tried to force relationships and likely missed out on friendships developing into what they could’ve been. The chances of the friend you meet in college being in your life 10 years after college is a lot higher than the chances of the boy/girl you meet turning into your spouse. Focus on the friends and if the spouse happens, awesome. 6) Being grown up isn’t half as fun as growing up. These are the best days of your life. I love where my life is right now. I love the hopeful anxiety of building a business and being a dad in four months. I love being married and the adventure of marriage. With that said, there’s something about growing up and finding yourself that is unmatched by anything else. It’s even the inspiration for this blog. If 28-year-old Jonathan could talk to 18-year-old Jonathan, he’d tell him to enjoy the next 4-6 years and not to wish them away because nothing will ever compare to them. Those are the six things I wish I knew in college. What do you wish you knew? Take Back The Mic is out today! What if you aren’t supposed to be good enough?